The Office English course offers a practical introduction to the vocabulary, expressions and language of the English-speaking workplace for business and office professionals. 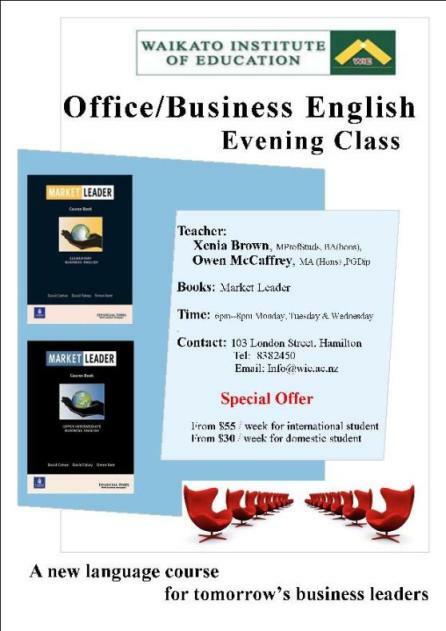 If you are ready to take your English skills to the next level this course is specifically designed to help you improve your office and business English. The Office English course helps you develop your English language skills at an upper intermediate to advanced level, with a focus on English language for the office and business. You will be given the tools to further improve your written and spoken English using topics related to essential office skills. Students will gain extra skills in the areas of communication and listening comprehension, as well as practice with business correspondence. You will learn practical English grammar and vocabulary that’s common within an office or to conduct business. In addition, you will learn NZ business etiquette for the office environment. The course includes seminars covering a variety of office and administrative tasks and skills.